Tripp Lite's SUPER7TEL15 surge suppressor offers complete AC and phone line surge suppression for comprehensive protection of workstations, desktop PCs, telecom systems and other sensitive electronics. Heavy grade AC surge suppression shields connected equipment from damage and performance problems due to transient surges. Set of RJ11 telephone line suppression jacks protect dialup and DSL modem lines, fax machines, cordless phones and more. SUPER7TEL15 offers 7 total outlets, extra-long 15 foot cord with space-saving angled plug and diagnostic LEDs to warn of wiring problems and suppressor damage. Heavy grade AC suppression rated at 2720 joules shields equipment from surges and line noise. Attractive white suppressor housing with keyhole mounting slots and 3 designated transformer plug outlets offers convenient protection of desktop computer equipment and accessories. Lifetime warranty with $75,000 connected equipment Insurance (USA, Puerto Rico & Canada Only). PROTECT ANY ELECTRONIC DEVICE FROM POWER SURGES & SPIKES: Surge Protector with seven outlets and built in RJ11 jacks protects your PC, personal computer, laptop, printer, scanner, router, phone, fax, modem, television, cable, satellite equipment, lamp or any other home/office electronics from dangerous power surges, spikes & line noise. POWERFUL AC LINE SURGE SUPPRESSION AND TELEPHONE LINE PROTECTION: This surge suppressor offers complete AC protection with seven total NEMA 5-15R outlets and includes one set of RJ11 telephone line suppression jacks protect dialup and DSL modem lines, fax machines, cordless phones and more (6-ft. telephone cord included). SAFETY FIRST! 2520 HIGH JOULE-RATING - CONFORMS TO UL 1449 SAFETY STANDARDS: Built-in power switch and 15 amp circuit breaker offers power control and overload protection over all outlets. Diagnostic LEDs confirm outlet grounding and surge suppression status. Heavy grade AC suppression rated at 2520 joules shields equipment from surges and line noise. Conforms to current UL 1449 3rd Edition safety standards. 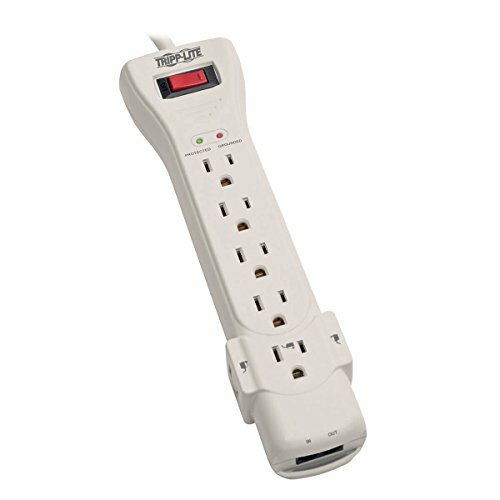 EXTRA LONG CORD FOR PLACEMENT IN ANY ENVIRONMENT: No need for an extension cord with this surge suppressor! The extra long 15' AC power cord provides the length to reach distant outlets. Plus, the right-angle NEMA 5-15P flat plug allows for furniture and equipment to be moved flush against the wall to save space. Keyhole mounting slots enable wall mounting. LIFETIME WARRANTY, $75,000 INSURANCE: Lifetime Limited Warranty and $75,000 Ultimate Lifetime Insurance covers any connected equipment damaged by a power surge. View More In Surge Protectors.